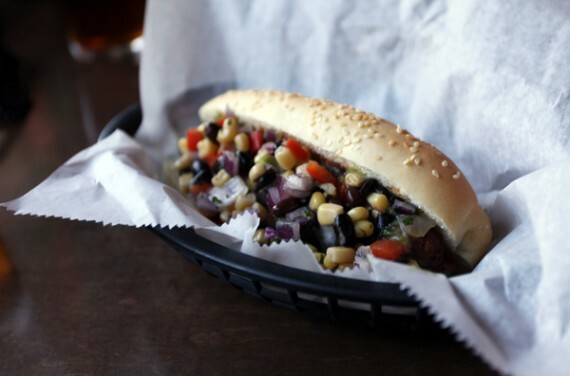 monday: eat vegan dogs to save beagles at tony’s darts away! this is way too good to pass up! mark your calendars, people. on monday november 21st our favorite pub, tony’s darts away, is donating half the proceeds from all vegan sausages all day to the beagle freedom project. tony’s darts away now open for BRUNCH on weekends! hell to the yes. starting this weekend tony’s darts away, our favorite vegan friendly pub is open early on weekends, and they’ve got a brand new brunch menu…not to mention a new outdoor patio! 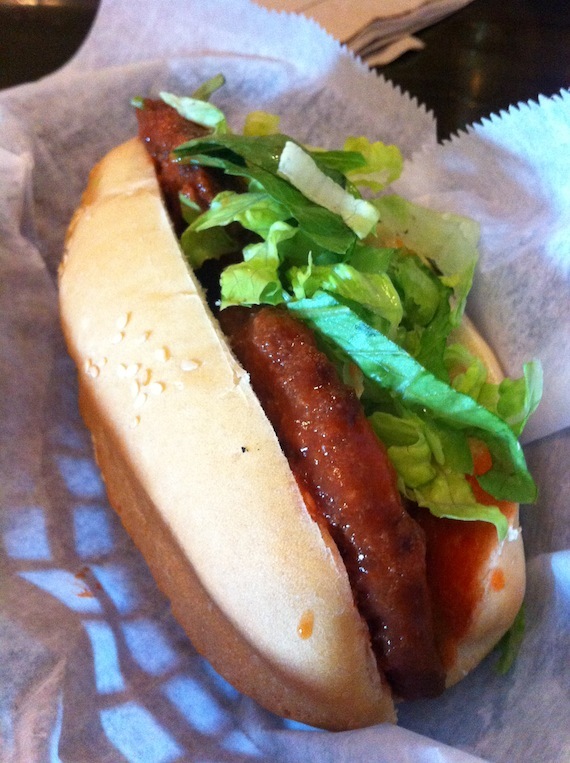 this week tony’s has been offering a vegan buffalo po boy made with a field roast country style sunflower cutlet and frank’s red hot sauce. our correspondent brittany ate it the other day, and sent us this photo along with a thumbs up. it’s my life’s mission to make it through all the rotating vegan specials at tony’s darts away, and i’m doing a damn good job. i was among the first angelenos to feast on the wheatloaf sliders when they came out in 2010, i’ve sampled the fleeting pickle chips, and i’m no stranger to the marinara “meatball” sub. after all that though, i can say with confidence that the “not so french dip” is my favorite special yet, and surely one of the most delicious vegan sandwiches in all of LA. 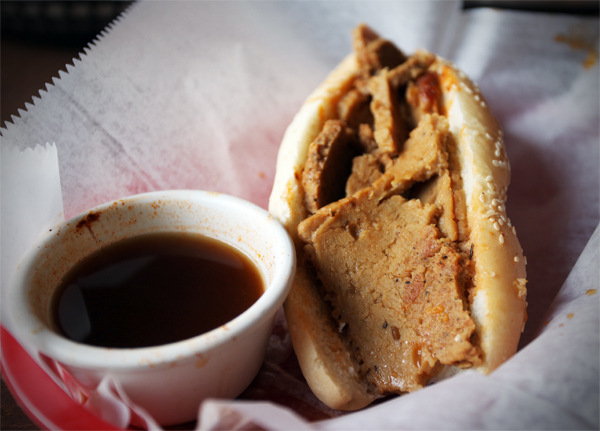 not so french dip: thinly sliced seitan on a bun with creamy sauce and vegan au jus. every time i eat a new special at tony’s darts away, i feel compelled to tell you immediately…because they never stick around for very long! 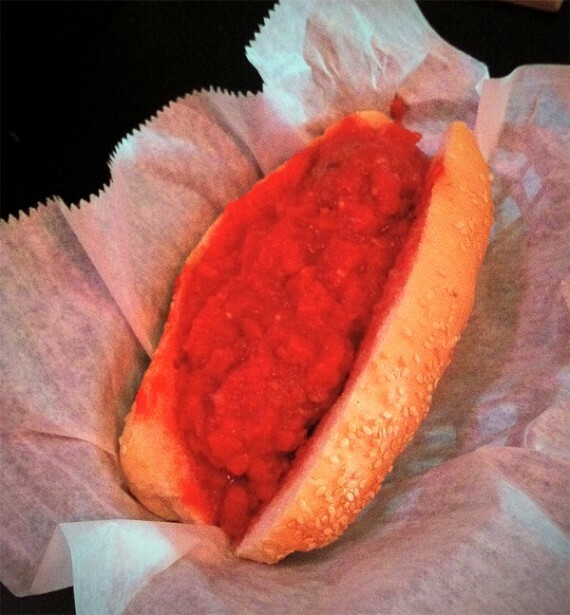 today tony’s is serving up vegan meatball sandwiches filled with marinara sauce and topped with daiya cheese. i ordered one without the cheese, and it was damn delicious. go eat one of these for dinner, who knows how long it will be on the menu. while mohawk bend is definitely my new favorite place to eat and drink in LA, we can’t forget about my old favorite place to eat and drink in LA: tony’s darts away. the casual burbank bar has a giant tap list of california beers and the best vegan pub grub i’ve ever tasted. i hit up tony’s last night with a couple of hungry omnivores, and we all chowed down on a massive amount of vegan snacks. 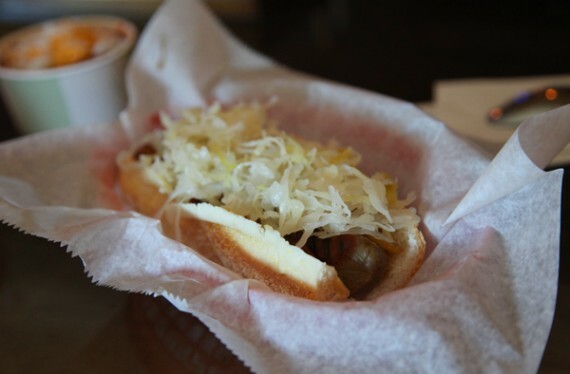 in addition to an impressive menu of sausages, salads and fried foods, tony’s is known for its rotating specials. crazy stuff like vegan mozzarella sticks, wheatloaf sliders, and sunflower po boys never stick around for very long. 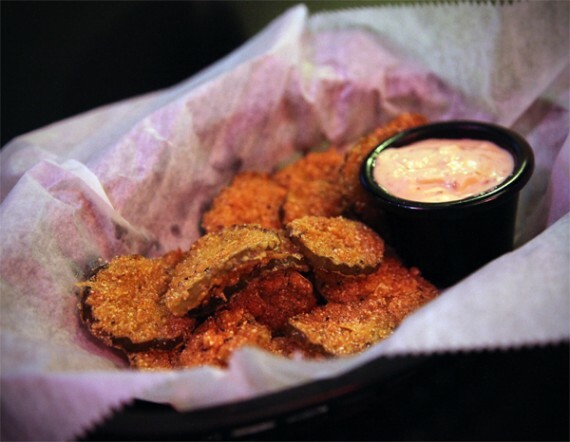 yesterday tony’s had fried pickle chips on the menu and we just had to split an order. 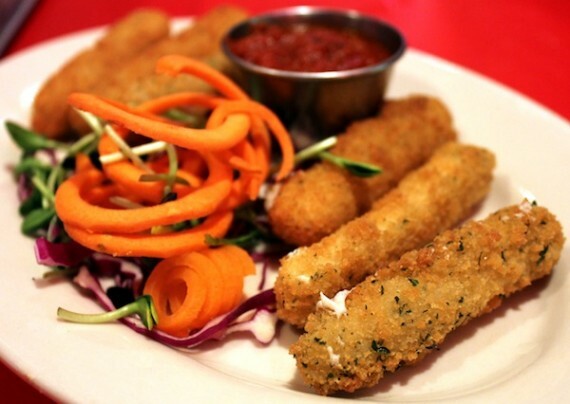 mozzarella teese sticks now at tony’s darts away! dudes, this is HUGE!!! the much coveted mozzarella teese mozzarella cheese sticks (we have been obsessing about them for ages) are now available at our favorite pub, tony’s darts away! 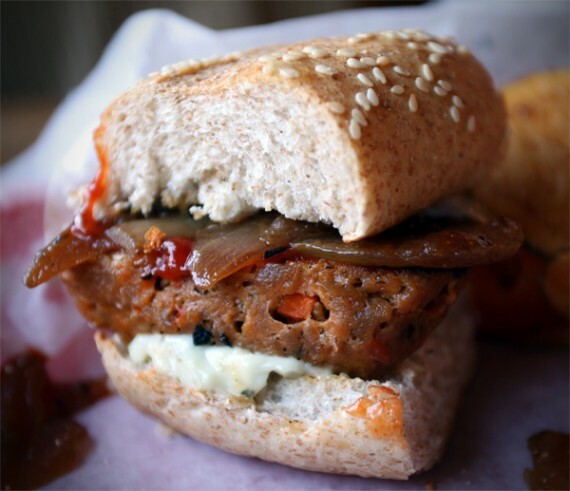 vegan burgers and beers! new on sundays at tony’s darts away. great news, peeps! staring this weekend tony’s darts away, LA’s very own vegan-friendly pub, will offer specialty burgers on sundays on a bi-weekly basis. 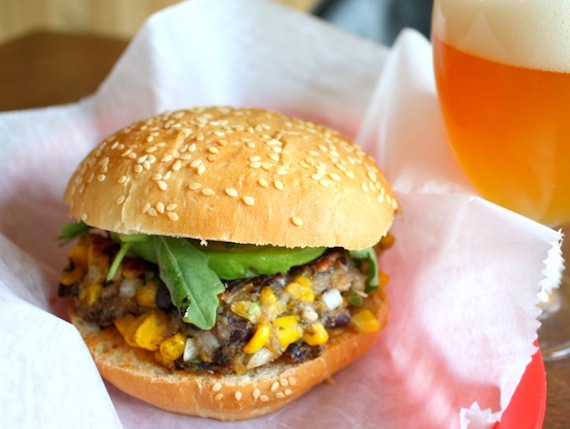 vegan burger and beer: you complete me. tony’s darts away is one of my favorite places to grab a weekday lunch. 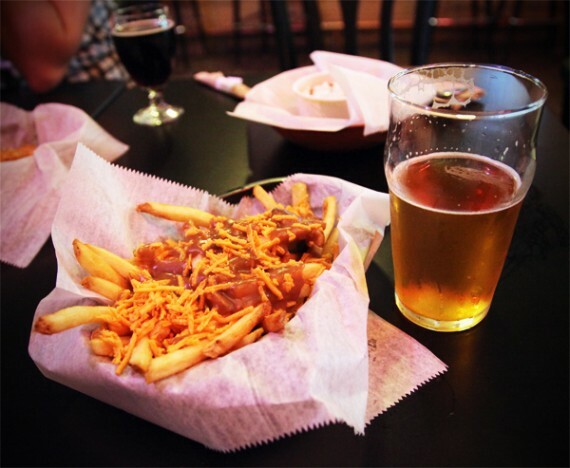 not only do they have a massive selection of craft beer on tap, but they’ve got great vegan sausages and a monday through friday lunch deal that comes with chips and salad. what more do i require? do we really need another reason to love tony’s darts away? 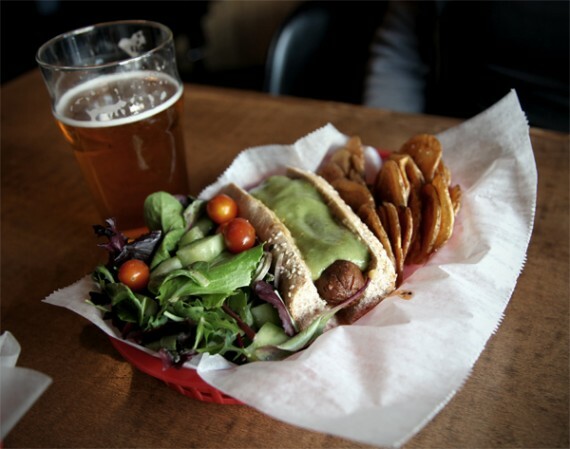 the incredibly vegan-friendly bar already has one of the best beer selections and some of the tastiest food in town. 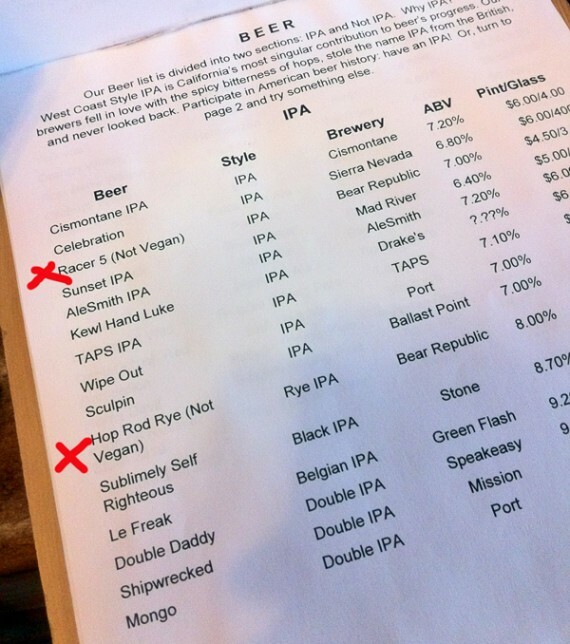 now you are telling me they even indicate on the menu which beers are vegan?! this is unheard of. non-vegan beer is called out on tony's menu! hell yes! vegan sliders at tony’s darts away! if there is anything on this blog deserving of an enthusiastic “hell yes!”, it would be these brand new vegan sliders from tony’s darts away in burbank. tony’s darts away keeps ruling for vegans. plus, HOT SAUCE! have you guys been to tony’s darts away yet?! if not, WTF are you waiting for? 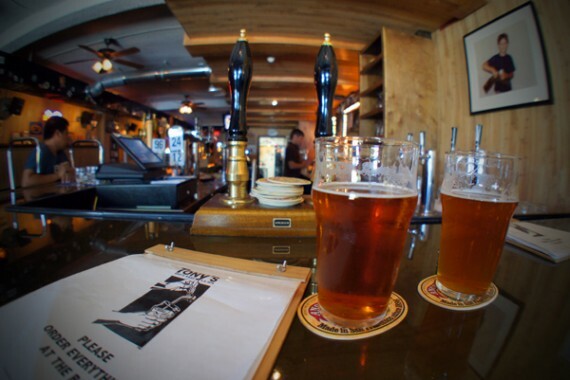 it’s the best place for vegan beer lovers in los angeles, period. the almost entirely vegan beer selection is massive (and so are the pours), the menu features some of our favorite products, the service is friendly, and the food is outstanding. 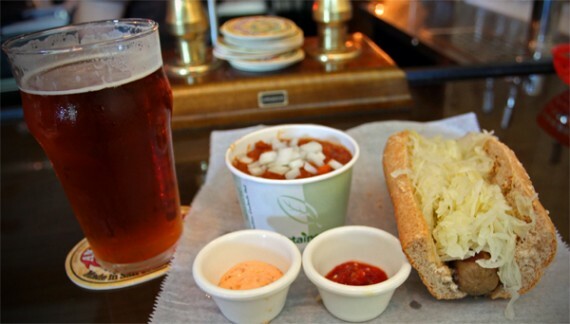 the ultimate vegan spread: firestone walker union jack ipa, vegan chili, 2 types of hot sauce, vegan beer brat with creole mustard, garlic paste, sauerkraut, and diced onions. but we’re not here just to tell you what you already know, we actually have some brief updates about the restaurant. first off, tony’s darts away now carries HOT SAUCE. we have been begging them to stock the spicy stuff for quite sometime, and tony himself even promised in the comments section that they were working on it. for awhile though, we were forced to smuggle in our own. well, not any more! tony’s now carries two hot sauce varieties. one is a standard red chili sauce, and the other is an awesome concoction made by the chef with a vegan mayo base. the mayo one is so freaking good, i could drink it by the gallon. even though tony’s is an omnivorous restaurant, they have decided to make just one version of their creamy hot sauce, and it’s vegan. so that’s pretty cool. secondly, tony’s has new buns for their sausages. in the past, people have criticized the buns for being too bready, and that is no longer the case. the new buns are light, soft, and sprinkled with sesame seeds…so tasty. 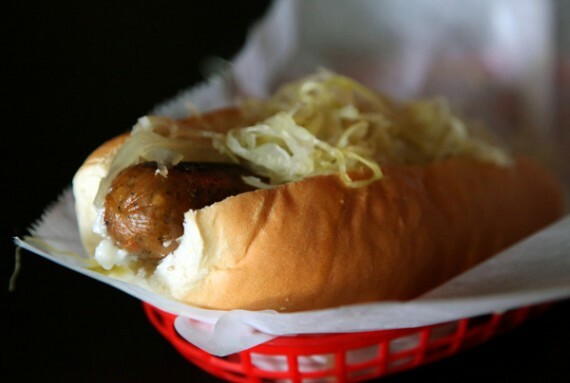 we took the new buns and hot sauces for a whirl (pictured above), with a beer brat topped with creole mustard, garlic paste, sauerkraut, and diced onions. the sausage was excellent, and the addition of creamy hot sauce and the new bun made it the best dog we’ve enjoyed at tony’s. 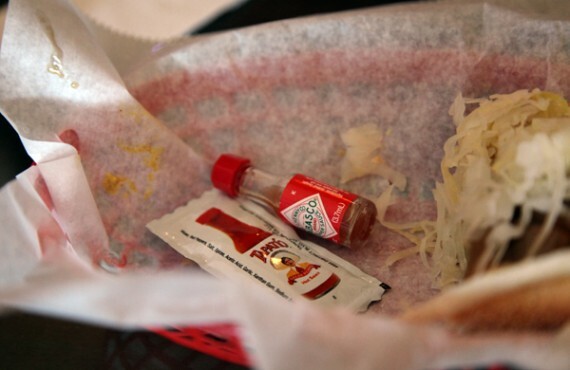 as of last sunday, the new hot sauce was not listed on the menu….so be sure to ask for it if you don’t see it. 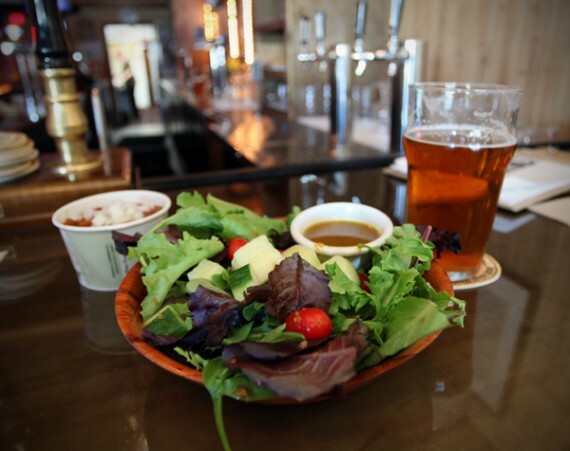 black diamond jagged edge ipa and a half pint salad. we also tried a salad for the first time at tony’s, and were pretty impressed. we got the half pint—a mix of california field greens, tomato, cucumber, and house vinaigrette. it was very simple, but fresh and delicious. plus, the portion was pretty big for just 3 bucks! tony’s is in the process of adding a new and more substantial vegan salad to the menu, with tofu and quinoa, and i can’t wait. i have had friends tell me more than once that it’s hard to find a seat at tony’s, because the place is always really busy. well, we were there on a sunday afternoon and it was super quiet and comfortable. we were chatting with the staff, and they remarked that saturday nights are usually surprisingly mellow, compared to friday nights which are crazy. just thought i’d mention that! i’ve said it before, and i’ll say it again: tony’s darts away rules. the only problem i have with this place is that it’s not closer to my house. get over to burbank and eat at tony’s if you haven’t already. it really is vegan beer and food paradise. i just can’t get enough of tony’s darts away! 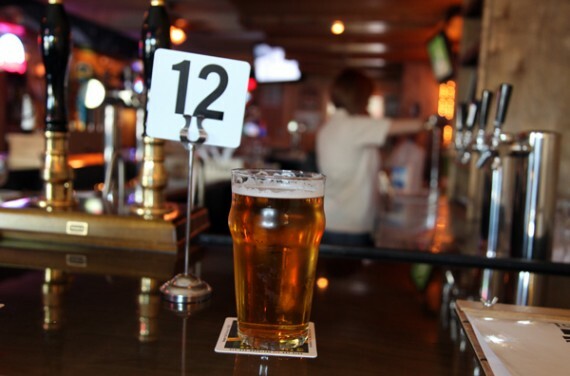 it’s the only real bar in los angeles with a vegan-friendly menu, the food is excellent, and they’ve got over 30 beers on tap. seriously, tony’s is amazing. i hit up the burbank boozer recently with a couple friends, and as to be expected, we had an excellent time. 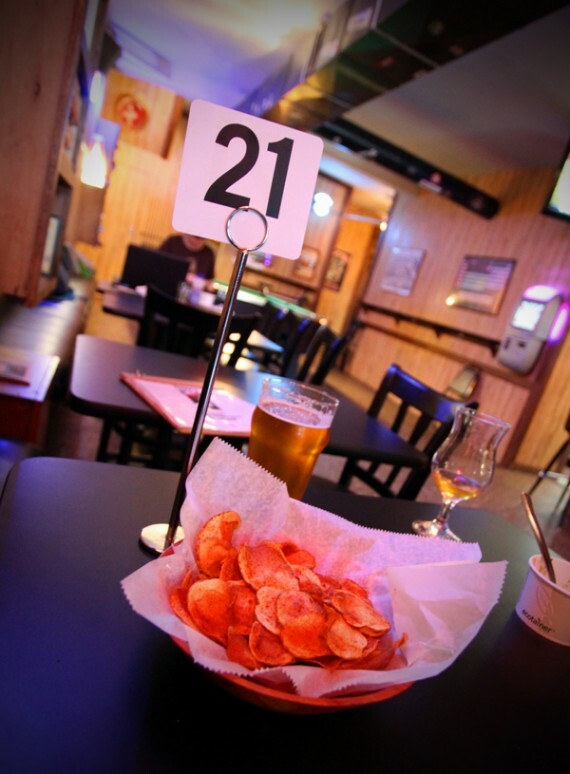 tony’s darts away in burbank has only been open for 5 weeks, and it’s already one of our favorite haunts. we’ve raved about the extremely vegan-friendly beer bar twice before, and i’m happy to report that with time it keeps getting better and better. first off, they’ve added 2 cask pumps to their something like 38 beers on tap. when we were there last, they were pouring craftsman (not pictured), and it was really damn good. i think it was poppyfields.